It’s such a familiar quandary – there you are in your local games store, crisp note in hand, looking for a new addition to your collection. There are a few caveats, though: one, you want it to be a linear adventure mainly based around flicking switches and collecting shiny things; two, you’re also very keen for it to have a Christian subtext; oh, and three, there simply has to be a homicidal dwarf involved. Well, at last, the game you want has arrived! To tie in with the second installment of the C.S. Lewis movie series, Traveller’s Tales have obviously decided that if it ain’t much good, don’t fix it. Prince Caspian follows an almost identical template to The Lion, the Witch & the Wardrobe, right down to the Level Select hub being a direct continuation of the last game. It’s also regrettably similar to the recent Golden Compass abomination, but unlike that game, at least Prince Caspian just about passes muster as a competent cash-in. 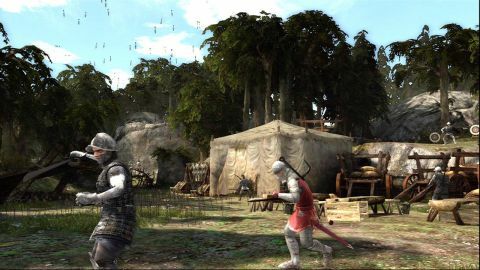 One of the game’s much-cited selling points is the inclusion of exclusive live action cutscenes and a prequel level not in the film, showing the battle for Cair Paravel a thousand years before Peter, Lucy, Edmund and Susan are sucked back into the land of Narnia to deal with another tyrannical usurper. In this training level flashback, you control a Minotaur, a dwarf, a centaur and a fawn as you fail to fend off the attacking Telmarines. Once the action switches to the main plot, you take control of the posh kids themselves, plus other characters with only ever-so-slightly different skills, adding up to twenty different avatars, for you and possibly a co-operative pal to control. We’re sure two Narnia-loving pals playing co-op would get some joy out of Prince Caspian, but as Traveller’s Tales seem to think that repetitive fighting of respawning goons interspersed with constant ‘find a cog, open a door’ tasks is fun, it’s possible that even such an easily-pleased duo would be cheering on the bad guys before that Lion turns up to save the day. Description In this fantasy action game, you'll play as 20 different characters from the Narnia universe, all with their own fighting styles and weaponry.